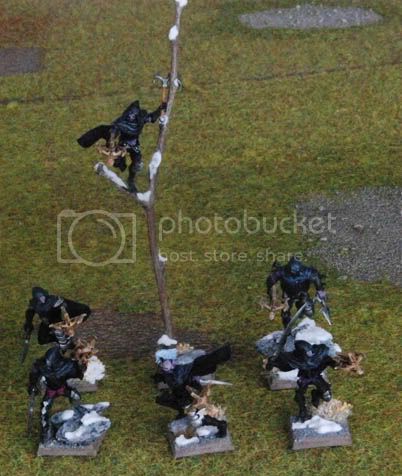 I posted a few shots of my Dark Elves in my Chaos Dwarf blog, but they're getting a new home here. This army is part of a "Tale of 4 Gamers" setup. We started with 500 points and try to add 250 points every two months. We play some games after every point increase. 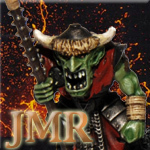 The other people play with Ogres, Dwarves and Orcs & Goblins. 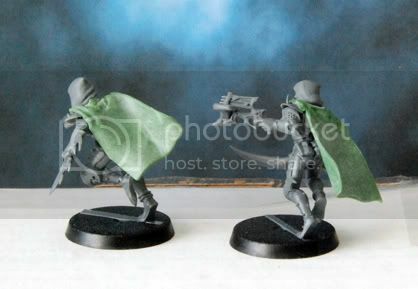 From what I can see the capes on the shades look great, can't wait to see them in battle. This post was last modified: 10-17-2011 05:49 AM by Bassman. It's been a while since we played our battles, but I've been without a camera for a long time and when it did get returned, it had an empty battery and no battery charger! I took army-shots today even though the light was pretty bad, which unfortunately shows in the pictures. Building up from my 500p list, I've added 2 Crossbowmen (removed Standard), another rank of Corsairs, 6 Shades, 5 Harpies and I put my Master on a Dark Steed. 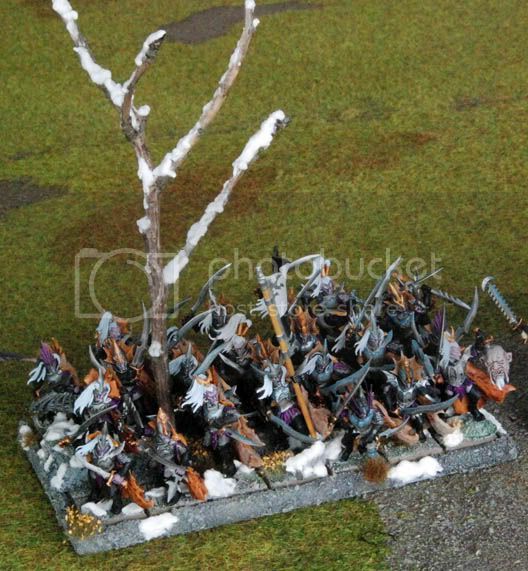 Pictured above is my full collection of Dark Elves so far, apart from my 750 list there are two models in the picture that weren't in the list: the standardbearer with the crossbow unit and the Master on foot. 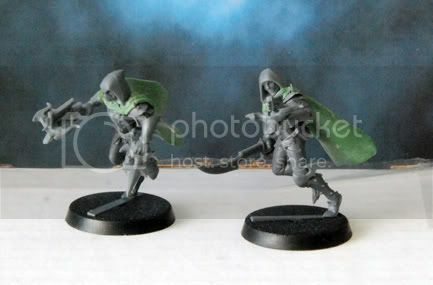 These things don't cost a thing and they are great as redirectors, warmachine hunters or just as a general annoyance. Added another rank for more staying power. I'm starting to wonder if it was really needed however. If I play my cards right, elves should be able to break most things on the charge and the front rank does by far the highest % of damage, especially if I add a Frenzy banner to them later. Crossbows can pump out a very nice number of arrows. In the battles however, they had some trouble when facing the dwarves, simply because the dwarven quarrellers out-range them meaning my crossbow unit gets reduced in numbers before they get to return fire. Still, a very useful unit that can serve as a decent combat block once they get a few more bodies and shields added. The Master on foot and the standard bearer weren't used in my 750p list. 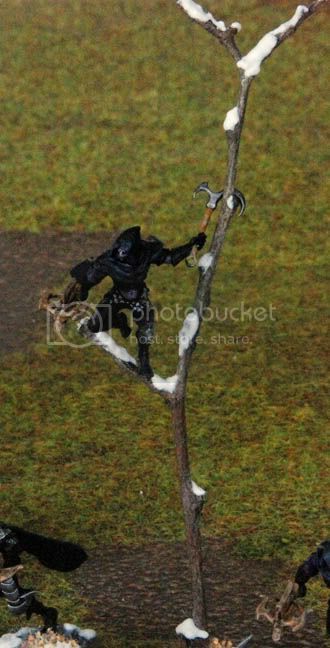 A bit of an unorthodox miniature for a Dark Elf perhaps. 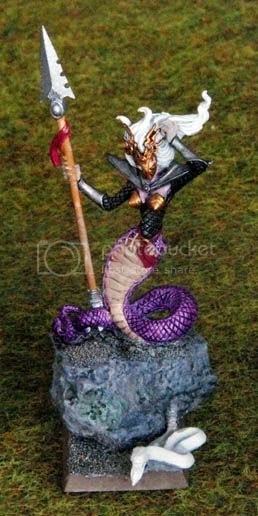 It's one of the things that show a bit of a Slaaneshi influence in my army. The snake body represents the model being mounted. Unfortunately this girl needs more paint and basing. My Master was definitely the star of the show. Solo-charging a unit of ~6 Ogre Bulls + Bruiser. The Bruiser rejected my challenge and went to the back rank. Ogres had to take a steadfast break test, failed and got overrun! Facing the dwarves she did a similar feat. 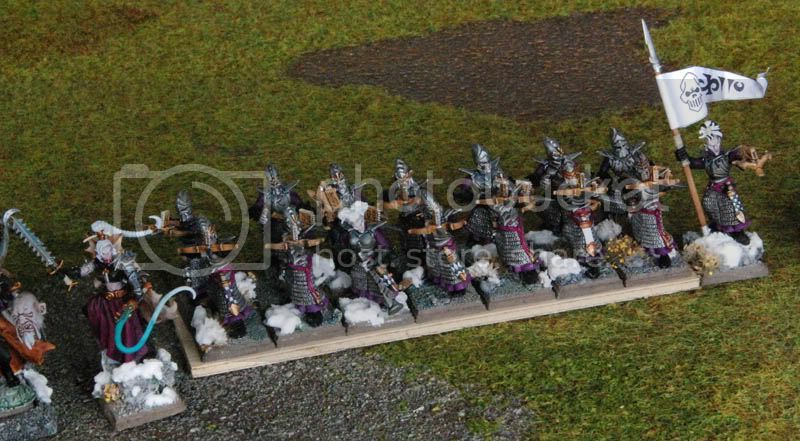 Flank-charged a gunline of ~26 quarrellers (in 2 rank deep formation). Forced a steadfast breaktest, they failed and got overrun. These two moves simply won me those games. 6 Shades with additional hand weapon. I've been dying to use these guys. 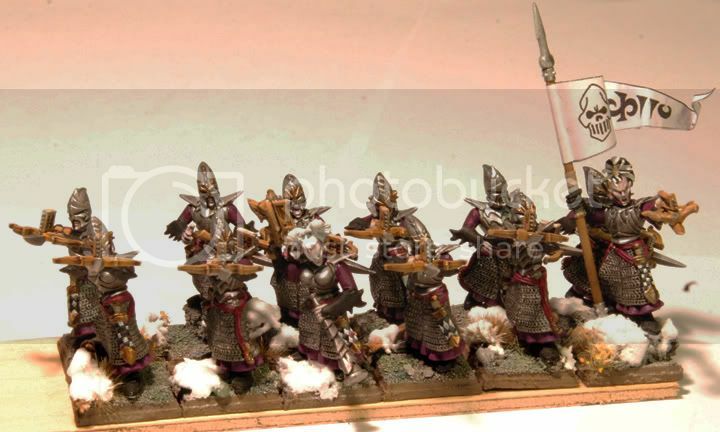 They're part of the reason I wanted to play Dark Elves. I've never played an army before that had scouting units. I just love them. Facing the ogres they deployed behind a unit of 5 Ironbelchers, who didn't have a musician. Result? They followed the ogres at their leisure for 3 turns and killed them without interruption. I wouldn't have been able to do that if the Ogres had a musician however. I may try to take better pictures if there is more light tomorrow. These are a bit ...grainy and dark. I'm not sure when the next battle is going to be (at 1000 points). 2 of the players are moving and practically rebuilding their house, so they've got their hands full for now. Stay tuned though! The army itself looks good. Love the harpies and the shades! Well done! Nifty use of Dark Eldar parts on your Master on foot! I also quite like the harpies which GW otherwise never quite seems to get right, and the naga-esque Master on Dark Steed. What do I think? These are great models! I can tell how much effort you put into these models. 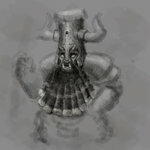 Well done, this is the first Dark Elf blog I have seen in a while. 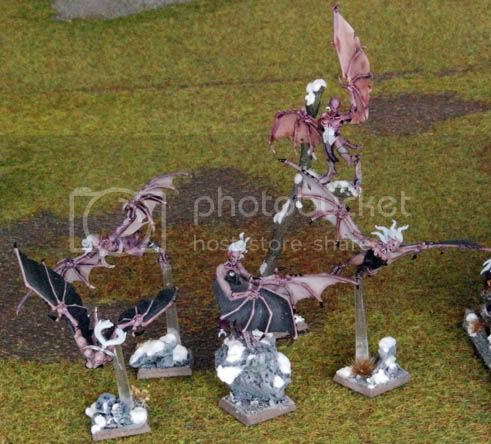 I love what you've done with your harpies, I was looking at something similar for furies in my Daemon army. 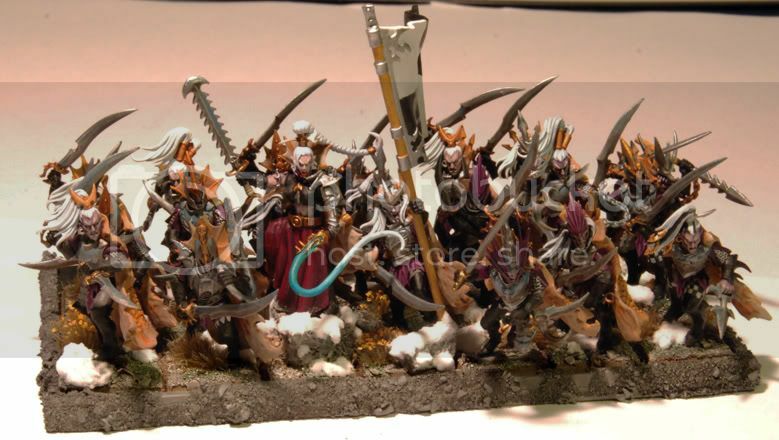 Always good to see a Slaanesh themed Dark Elf army and I really like your use of Dark Eldar bitz.